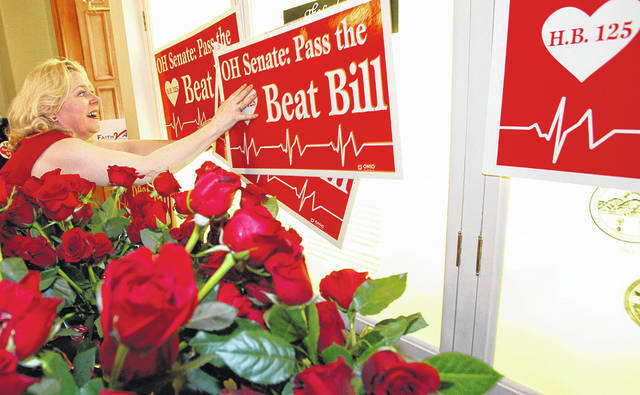 FILE - This Feb. 14, 2012, file photo shows Janet Folger Porter, president and founder of Faith 2 Action, posting signs during a news conference at the Ohio Statehouse in Columbus, Ohio. Porter, the polarizing figure who originated the bill and championed it for a decade, says it stung to be excluded from the Thursday, April 11, 2019, signing. But she’s pleased the bill is finally law. Porter acknowledges her unusual tactics have made her some political enemies over the years. That includes the powerful Ohio Right to Life and the Ohio Senate president, whom she challenged in a primary.